In our parts of the world the winter is knocking on the door, and we are ready to meet it no matter how long and hard is going to be. With gloves and hat we will surely stay warm, and we have taken a look at some of the best and most elegant gloves and headgear to meet the cold times. There is hardly anything worse than playing football when you're not getting the ball, and really feel like you are not part of the game. Well, maybe if you are not getting the ball and on top of that is freezing your ears and fingers in the cold. Both head and hands are rather vulnerable areas in the cold, and you can quickly feel uncomfortable if you don't have the correct equipment; and therefore we now take a look at some of the gear that will keep you warm during the cold winter. The beanie hat is as classic as it gets for winter gear, and weather you are playing football, skiing or just walking around the winter cold, it is important to remember your beanie. Your head is the part of your body that submits heat the fastest, so if you are looking to stay warm an avoid the cold a cool beanie will get you a long way. Beanie hats can be found in many colours and variations, which we will now take a closer look at. Are you looking to get a nice beanie, then you can see much more right here. The good Americans at Nike have provided us with a nice selection of beanies. If you are going for the very classic style you can go for the Nike Beanie Black that is rather anonymous, but will keep you warm. The beanie has a classic and simple design including a fleece lining around the forehead. Alternatively you can go for the grey Nike hat with an elegant fold around the forehead. On top of looking elegant, it also adds to keeping you warm. 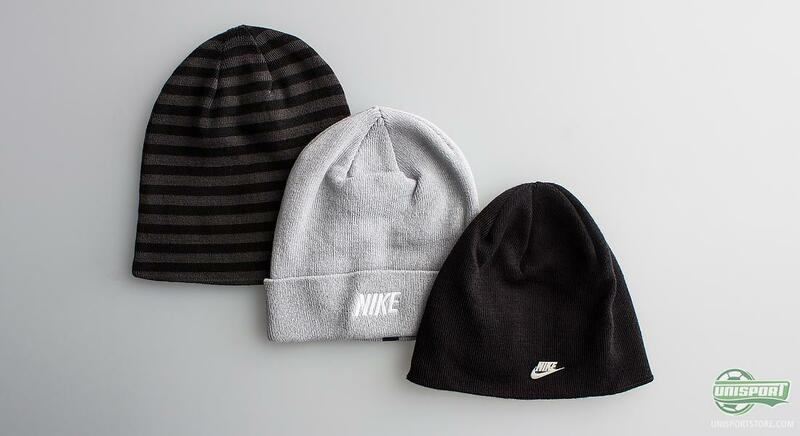 Are you looking for a few different design to choose from according to your situation, then you can go for the reversible Nike beanie with a classic grey design on the one side and a more modern striped design on the other side. It is, although, not just the American giant Nike who can sort you out in regards to your head gear when the temperature is dropping. At Under Armour they have also been busy with the production of hats and beanies, and just as we saw with Nike, there is a selection of three different designs to choose from. 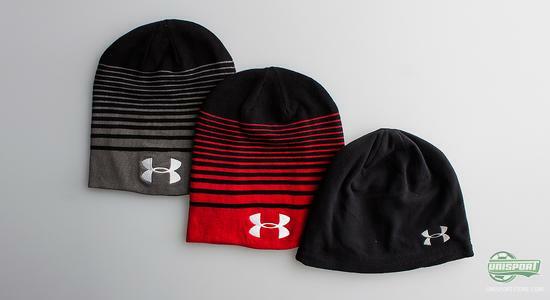 If you want to be absolutely sure to stay nice and warm you may wanna look at the Under Armour fleece beanie. The beanie is nice and comfortable to wear and has a sharp design with the Under Armour logo in front. Or you can go for the elegant and warm grey/black Under Armour hat or the black/red Under Armour hat. They are both reversible, thus enabling you to choose either a simple design, or are more modern striped design. In addition, these hats are made with the option of folding the lower part and hereby providing extra warmth to your forehead. 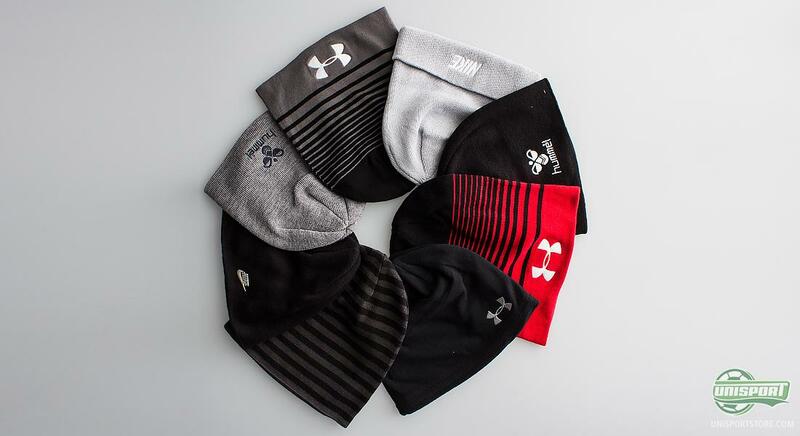 Would you like to get your hands on the super nice Under Armour beanies, then you can see much more right here. Once you've got your headgear sorted, than we are ready to take care of the hands. Your bare skin can get into trouble in the freezing cold. And therefore we now take a closer look at the hands best friend  gloves. With the right gloves, you can say goodbye to freezing fingers, and today they come in advanced thin and well ventilating models, which we will now look into. Are you looking for gloves, then you can find much more right here. There are certain key points to be aware of regarding gloves for the modern footballer. 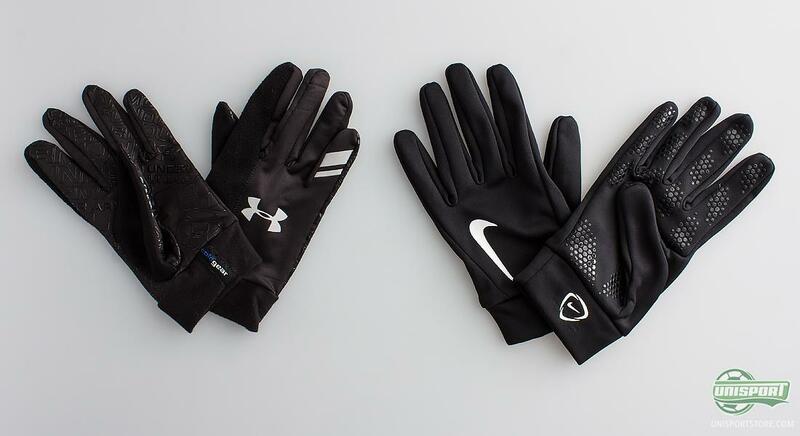 The gloves can never be in the way, it may not feel 'thick' to wear, and it cannot hinder your play. 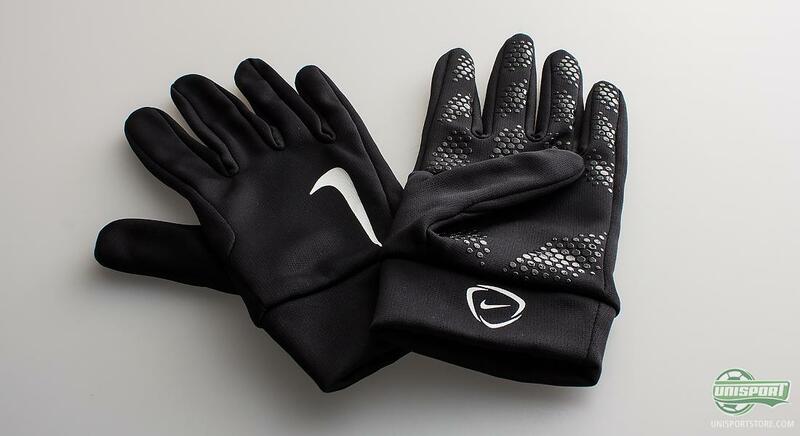 This is the point of departure for the Nike Hyperwarm glove. 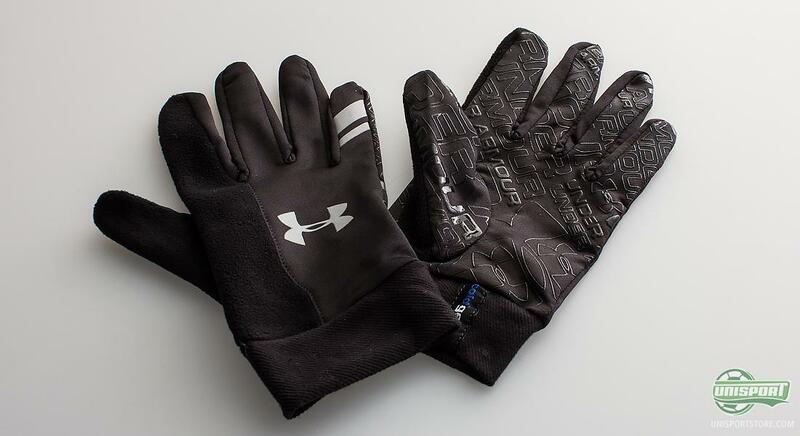 Made of Dri-Fit, this glove will keep your hands as dry as possible even in tough conditions. It has a perforated palm for optimal ventilation, and has silicone zones, also in the palm, to help you facilitate the long throws. The result is a glove that can perform throughout the 90 minutes of a match. If you would like to get your hands on the super nice Nike Hyperwarm gloves, then you can see much more right here. it is not just Nike that have been cooking up a glove that can meet the needs of the picky and demanding footballer, who expects top level equipment. Under Armour have taken to the lab and came out with the brilliant Under Armour Cold Gear players glove. The glove is equipped with a sweat wicking system to transport the sweat away from your hands. Moreover, the gloves have a rubber coating in the palm that helps to an even better ball grip. Under Armour also presents a brand new and rather untraditional feature, to meet a very well-known issue, a dripping nose. On the index finger they have placed a special microfibre area, dedicated to wipe your nose with. The entire head area is vulnerable once the freezing cold kicks in. Especially around the neck, it can be hard to keep a constant temperature, and therefore, a neck warmer may be worth looking into. 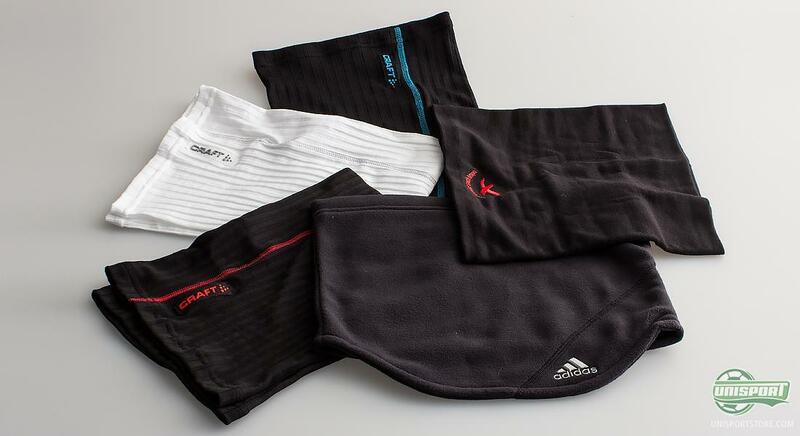 Especially since both Adidas and Premier Sock Tape have created two elegant and warm neck warmers. 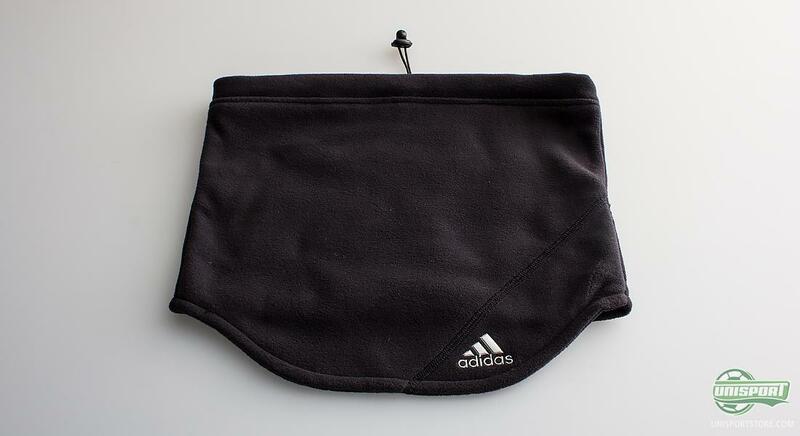 The Adidas neck warmer is made of the functional ClimaWarm material, that provides unique heat isolation on the cold days. The Premier Sock Tap neck warmer is, in addition to being warm, actually developed for football. 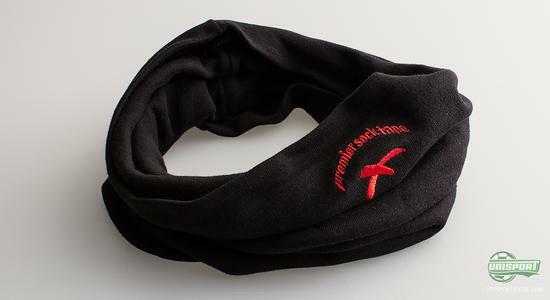 It has been developed to prevent muscle injuries around your neck area, and according to Premier Sock Tape, you will have a 75% less of a chance to get neck injuries by wearing this neck warmer. Are you looking for a neck warmer, then you can see much more right here. 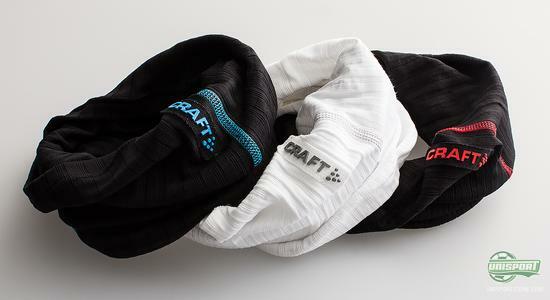 If you are looking for a neck warmer, a hat, a sweat band and sometimes a bandana, then this Craft Multifunction tube is spot on. It has been developed to be suitable for all kinds of purposes, at it is more or less just your imagination that sets the limits to its usage options. The multifunction tube comes in three different and nice colours, so you can be sure to find the colour that matches just your personal style. Although the winter is knocking on our door, there is no reason to just stay indoor. It's all about having the right equipment; and once you have that, then you can stay sharp and fit throughout the winter and be in fine shape once the spring season kicks in. What kind of equipment do you use during winter? And which of the products are your favourite? Feel free to share your opinion in the box below, or on Facebook & Twitter.